We make reasonable steps to ensure optimal life-long health. Each of our breeding cats is tested for Erythrocyte Pyruvate Kinase Deficiency, an inherited type of anemia, and Progressive Retinal Atrophy, a disease causing blindness. We periodically screen for Hypertrophic Cardiomyopathy (HCM), the most common heart disease among domestic cats. We feed high-quality foods, including human grade meat. 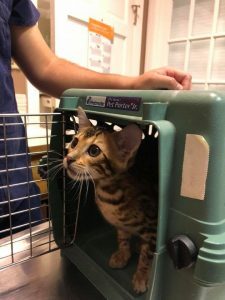 Kittens receive an exam from a licensed veterinarian, two rounds of shots, and de-wormer. Whenever possible, we spay and neuter pet kittens prior to placement. We do not offer a “health guarantee.” If you read the fine print of a typical “guarantee”, you will find it covers a very short period (often days), and is full of exclusions. We find this language misleading. We choose to offer a comparable “health assurance” clause in our contract. Essentially, we will refund or replace a cat in qualifying circumstances. We strongly encourage adopters to maintain life-long pet insurance and to proactively manage animal health with a qualified veterinarian. Brilliantbengal is not responsible for any veterinary, transportation, or other animal care costs, once an animal leaves our possession. No amount of testing or good breeder husbandry can prevent unforeseen issues. We can’t prevent your spouse from accidentally shutting the cat’s tail in the door, safeguard your cat from all colds, or reverse the natural process of aging. Those who are unprepared to navigate veterinary issues and eventual loss are urged to reconsider pet ownership.